I am fundraising for my sister-in-law. 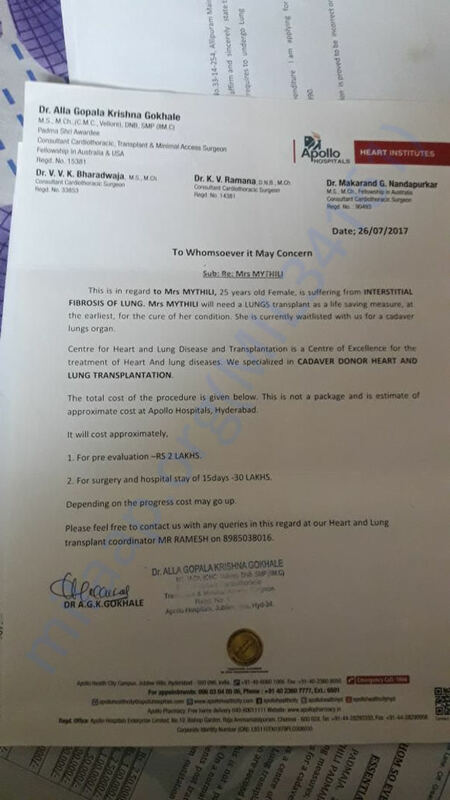 She has been suffering from the last five years and need an urgent lung transplant. 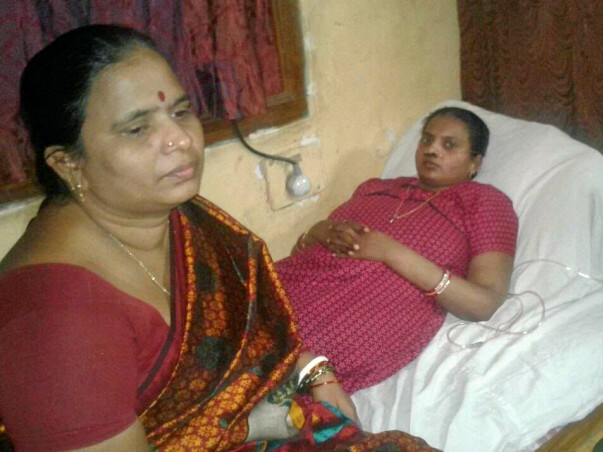 Mythili’s mother has been fighting for her daughter’s recovery for the past five years. Two and a half years ago, in January 2015, Mythili got married. All was well, until about six months into her marriage when Mythili fell sick. Doctors thought it was a lung infection. Ultimately, it was diagnosed that the only way for her to recover was a lung transplant. On hearing this, Mythili’s husband abandoned her. Mythili now faces an uphill battle. The family has spent over Rs 15 lakhs for her treatment so far. Mythili’s mother is a housewife, and has no means of support. Her younger brother works in small teaching organization and earns Rs 9000 a month. This is the source of income for Mythili and her family. Mythili is only 25 years old, and has the rest of her life ahead of her. I am fundraising to ensure that she recovers and is able to lead a long healthy life. Kindly support Mythili! We are extremely thankful for all the love and support you have shown towards Mythili. With a heavy heart, I regret to inform that Mythili is no more. She faced breathing issues leading to lung failure. We will update you regarding the utilization of funds shortly. Again, we thank you for all the love and blessings. Please pray for her family. Mythili is fighting very hard but her condition is deteriorating. She is still at home and is on ventilator support. The doctors say that the needs a transplant as soon as possible but we haven't been able to find a donor yet. She is on medication but that will not be able to help her in the long run. Do keep praying for her. Thank you all. As of now, there hasn't been much improvement in Mythili's condition. She is currently at home and on ventilator support. We are still searching for a donor and have registered in the donor list. Doctors have suggested that the she might need a transplant soon and as of now she will stay on medication. We will post an update once we find a donor but I request you all to kindly pray for her and please share this campaign with your family and friends. Thank you so much for your love and support which have shown towards her.